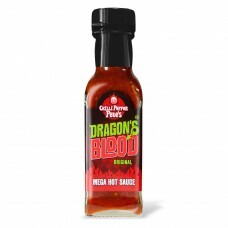 What can we say about the legend that is Chilli Pepper Pete's Dragon's Blood Original Mega Hot Sauce? It's won a heck of a lot of awards, setting a standard that other chilli sauces can only aspire to. Well balanced with undertones of pineapple and fruity Naga Ghost Bhut Jolokia chillies, this sauce has a deeply satisfying burn from the 6.4m scoville extract that keeps on giving, for some up to half an hour. At 800,000 scovilles, this sauce is one of the hottest products on the market for everyday use. The mark of a top quality sauce is repeat orders - we'll see you soon! Suitable for vegetarians & vegans. Wheat, dairy & GM free. 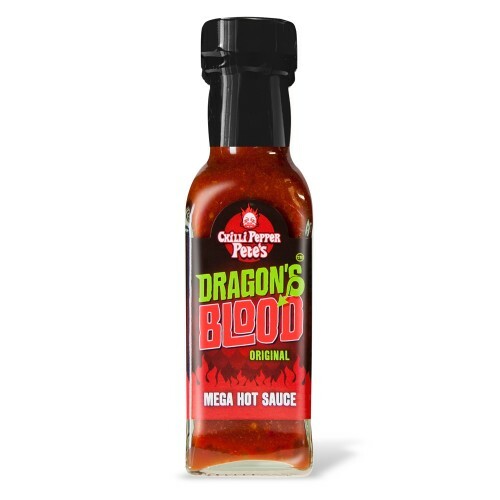 Heat: 12/10 Info: So ... Dragon's Blood Original Mega Hot Sauce isn't hot enough for yo..